RSB Cinemas from Wijchen is a pioneer in the concept of service cinema in the Netherlands, where personal attention and a relaxed atmosphere are of paramount importance. RSB Cinemas operates several service cinemas in the center and south of the Netherlands. 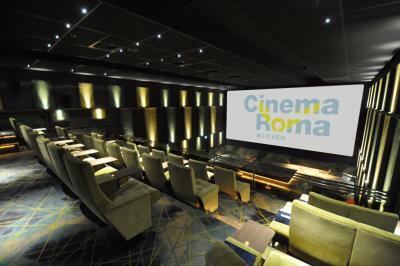 For the three halls in the newly built Cinema Roma Wijchen, RSB Cinemas chose speaker systems from Alcons. RSB Cinemas started as a small village cinema in Wijchen near the town of Nijmegen. The service concept has now been expanded to several sites in the region such as Uden (NB) and Houten (Utrecht). The geographical expansion and constant upgrading of the rooms was mostly financed from own resources, through which a greater stability and independence can be achieved, according to the exhibitor. "In the new Wijchen cinema the highest possible quality is pursued in every area," says branch manager Koen Brits. Guests are treated to a stylish decor, designed by a renowned architect. The movie experience is even more intense because the screens are many times larger in comparison with the previous building. Also the sound system is extremely advanced. Managing Director Han Wolf RSB Cinemas had been aware of Alcons for some time. In collaboration with RSB colleague Joop Hamers and Edwin de Winter, of Alcons dealer Dcinex, Han did extensive research on the various options for the rooms in Cinema Roma. By comparing different sound systems, RSB Cinemas finally opted for Alcons systems. In the three rooms of Cinema Roma, the following components are in use; In two halls bi-amped CR3 systems are used for the front channels. The 3-way CR3 features double 15” vented woofers for LF, 2 units 6.5” mid-speakers and 2 units RBN401, Alcons multiple-patented 4” pro-ribbon driver (1600W total peak power). For LFE, the CB181sl ultra-shallow (10.8-in/275mm) single 18” subwoofer was used, while the CCS8 coaxial 8” was deployed as surround. The third room uses the passive CR2 for the LCR channels. The 3-way CR2 features a single low-impedance 15” vented woofer for LF, 2 units 8” mid-speakers and one RBN601, 6” pro-ribbon driver for MHF. For LFE, the CB181sl ultra-shallow 18” subwoofer was also used here, as well as the CCS8 coaxial 8” for the surround system. All systems are powered and controlled by the Alcons Sentinel3, the dedicated 4 channel amplified loudspeaker controller; The Sentinel3 includes all protection and optimization settings for the best system performance with ultimate reliability. "The great strength of Alcons with this set-up is the low distortion." Han Wolf explains. "In the past we received complaints about the sound being too loud. In practice such criticism actually means the sound distorts. We then turned the processor level down, but that is not the right solution of course. Now with Alcons, we play at a higher sound level and we get less complaints. We even get compliments on the sound quality! This kind of reactions are typical; The unique low distortion of Alcons provides a much better theater experience. " The system is now active for some time and in addition to the positive reactions of visitors, there are also rave reviews in the local press about the excellent facilities and high sound quality of Cinema Roma. More information on: www.cinemaroma.nl and www.alconsaudio.com .